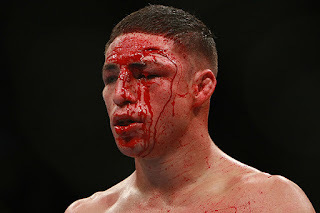 Nothing lasts forever, especially in the UFC. 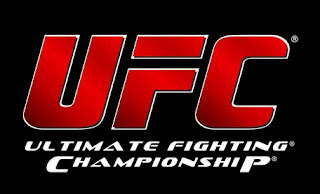 It is extremely rare for professional fighters to achieve an undefeated career, and such a thing has actually never been done in the world of Mixed Martial Arts (MMA) within the UFC. Everyone makes mistakes, everyone has a bad day, and everyone loses eventually. Fighters who win face increasingly tougher opponents, higher stakes with much more on the line, and more pressure to succeed and live up to expectations. As the winning-streaks continue, the probability of continued massive success actually decreases. Not only does the competition improve, but the champion fighters also have to deal with increasing age, declining strength, and overall arrogance which likely factors into their losses. 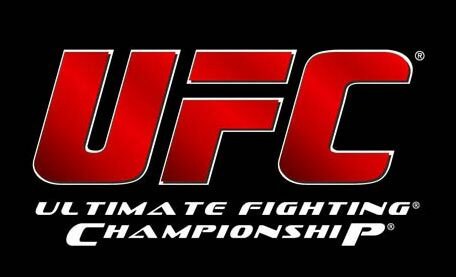 Yet when it comes to UFC events over the past two years, fans have been completely shocked by the major "upsets" and losses of Ronda Rousey, Conor McGregor, and Holly Holm. The longer the winning streaks, the higher enthusiasm for the fighter. But in reality, these fighters lost exactly at the highest peak of their popularity, and specifically when nearly everyone thought a win was "guaranteed". 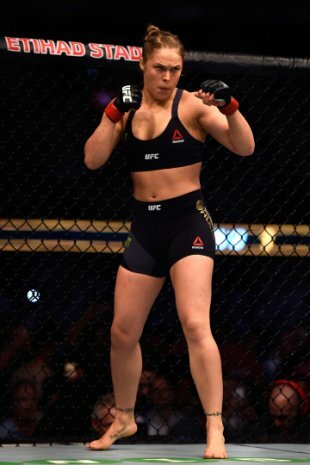 Ronda Rousey took the world by storm in 2015, as she carried a 12-0 undefeated professional record into her highly publicized and highly anticipated UFC Championship fight against Holly Holm in UFC 193. There was so much to be excited about: Ronda Rousey was a huge role model for women all over the world, she was undefeated, she had a strong personality, and she was destroying her opponents! Leading up to UFC 193, Rousey finished 11 out of 12 of her opponents within the first round! Even more impressive (and probably a factor in her over-confidence), Rousey won the three fights leading to UFC 193 in 16 seconds, 14 seconds, and 34 seconds. 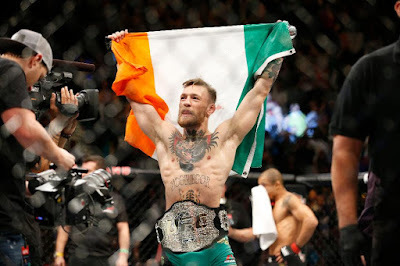 Conor McGregor also soared in 2015, as the loudmouth, larger-than-life personality was backed by a 15-fight winning-streak dating back to 2011 and the title of "UFC Featherweight Champion". He was a hero not only for Ireland, but for people all over the world. His abilities and trash-talking brought him to the top of the fighting world, but his arrogance would lead to his failure in UFC 196. To be clear, Rousey and McGregor definitely deserved the credit and excitement. I am not questioning their abilities, I am instead questioning the over-confidence by fans, commentators, and Las Vegas odds-makers that they would keep winning. After such impressive win after win, it's hard to imagine these champions losing; but it is specifically at these times that the biggest upsets materialize time and time again. Both Ronda Rousey and Conor McGregor earned their success, but the world took it too far. 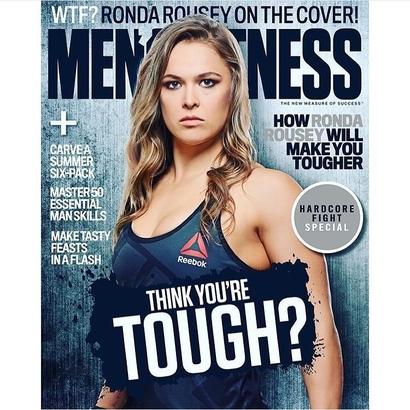 Rousey became overrated when Sports Illustrated declared her "Unbreakable" and when she became the first woman ever on the cover of Men's Fitness magazine. She was definitely a superstar, but every fighter has a weakness or a bad fight; "unbreakable" went a bit too far and was proven wrong about 6 months later. We're not even discussing all of the other magazine covers, movie roles, and promotions Ronda had. Perhaps the biggest sign of over-confidence in the over-rated Ronda Rousey was the betting odds leading up to her UFC 193 match against Holly Holm. 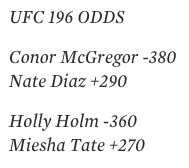 For UFC 193, Rousey was one of the biggest favorites of all-time. To win only $100, you'd have to bet between $700 and $2000 on Rousey (depending on the oddsmaker). If you bet on Holly Holm, you could earn up to $700 for just a $100 bet. The odds were extreme, pointing directly to an extremely over-confident crowd. Holly Holm was also undefeated (9-0) leading up to the fight, why wasn't anyone paying attention? The payout was slightly different depending on where you look, but McGregor was still a huge favorite at either -$380 or -$430. But it wasn't Conor McGregor's odds of winning that hinted at a loss, as much as it was his over-confidence and arrogance. 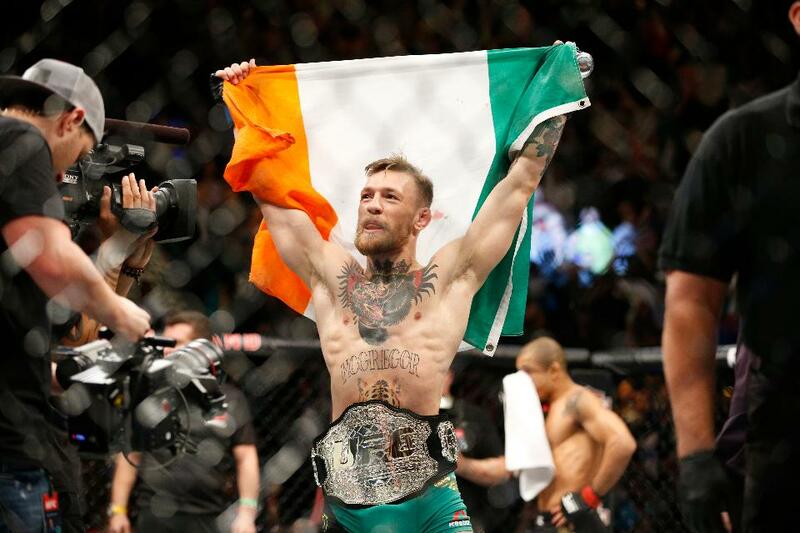 As the UFC Featherweight Champion, McGregor dominated the 145-pound division. Now, however, he was reaching FAR beyond his domain. Not only were his Vegas odds of winning very high, but he moved up two weight classes to 170 lbs for a fight against one of the best fighters in the UFC, Nate Diaz. Diaz is great on his feet, with excellent boxing abilities, and his black-belt Jiu Jitsu game is arguably #1 in the UFC. McGregor should have learned from the failures of BJ Penn. Penn, known as "The Prodigy", was a UFC champion in two weight classes (155 and 170), but his arrogance led him to failure and underperformance. BJ Penn could have probably dominated the 155-pound Lightweight division for years, but instead he attempted to dominate the 170-pound Welterweight division when he simply was undersized against the legendary George St. Pierre (GSP). 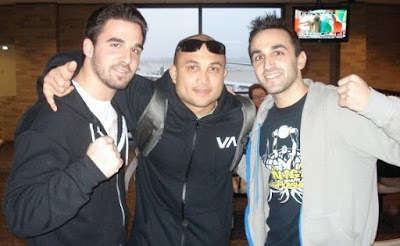 When BJ Penn did focus on his real weight class, he dominated. Hopefully McGregor will learn his lesson and stick with his natural weight class, rather than trying to conquer what's beyond his grasp. Remember, nobody is perfect and anyone can lose, especially when you least expect it.